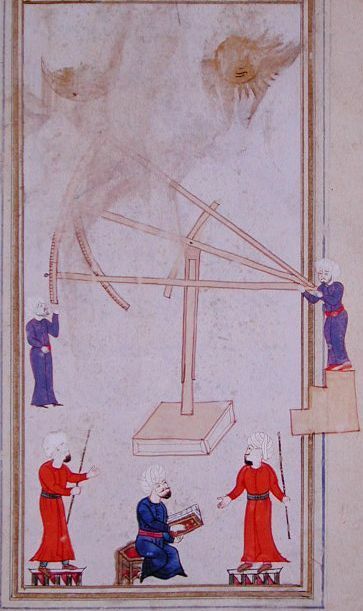 In this article, Professor Sevim Tekeli, an outstanding scholar in the history of Ottoman science, describes the instruments built by Taqî al-Dîn Ibn Ma’ruf and his team at the Istanbul observatory (was in activity between 1577 and 1580), and points out in particular the close resemblances between them and those used in Western Europe by Tycho Brahe, at the same time, in his observatory at Uraniborg Castle. 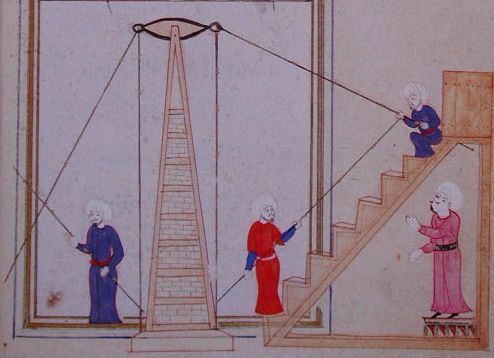 “Astronomical Instruments of Tycho Brahe and Taqi al-Din” by Sevim Tekeli. Four hundred years ago, an observatory located at Tophane, on the European side of Bosporus, famous as Istanbul Observatory, was founded by Taqî al-Dîn al-Râsid, under the sponsorship of Sultan Murad III (r. 1574-1595). 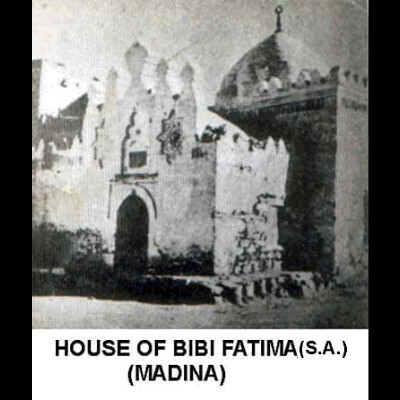 It is stated in certain other sources, on the other hand, that it was Taqî al-Dîn who took the initiative in this matter, and that he suggested to Sultan Murad III to found an observatory. Taqî al-Dîn wished to have an observatory founded in Istanbul, and the Grand-vizier Soqullu Muhammad Pasha and Khwaja Sa’d al-Dîn became interested in the matter and supported him. He prepared a report, to present to the Sultan, explaining the necessity of founding a new observatory. In this report Taqî al-Dîn explained that the available astronomical tables had grown outdated and new tables based on fresh observations had to be compiled . As a matter of fact, the recent researches showed that this observatory had been accomplished as one of the largest of the observatories built in 16th century, comparable to Tycho Brahe’s Uroniborg observatory (in 16thcentury) as well as Ulug Bey’s Samarqand observatory (in 15th century) and Nâsir al-Dîn Tûsî’s Maragha observatory (in 13th century). 3) the quality of the astronomers connected with it. 3. ‘Âlâ al-Dîn al Mansûr’s Poem . 1. 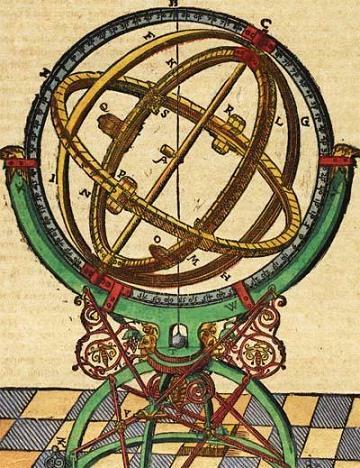 An armillary sphere (dhât al-halaq) with six rings for the measurement of latitudes and longitudes. The radius of the rings is more then four meters. 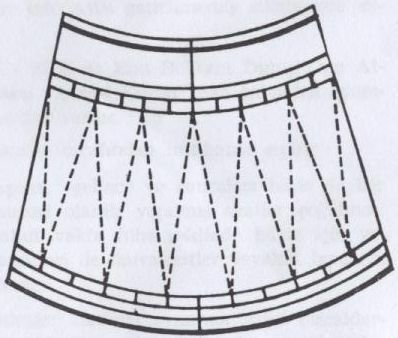 All the rings are placed on a base called the horizon, and the horizon is placed on six columns, the lower ends of which are attached to another stool like the horizon. 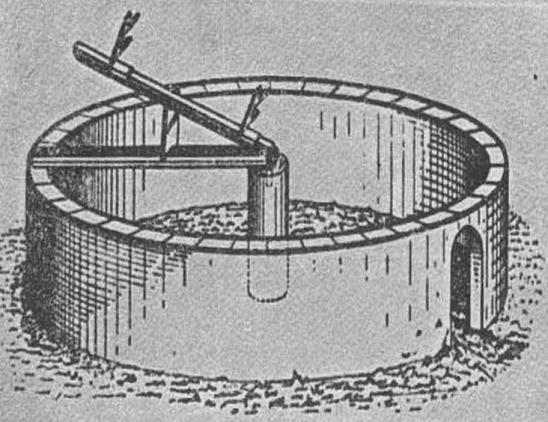 This form of base is generally used in 16th century in Europe (see Figures 1 a-b). Figure 1a: Armillary sphere (dhât al-halaq) of Taqî al-Dîn. Source: Istanbul Topkapi Library, Hazine 452, f. 89 . 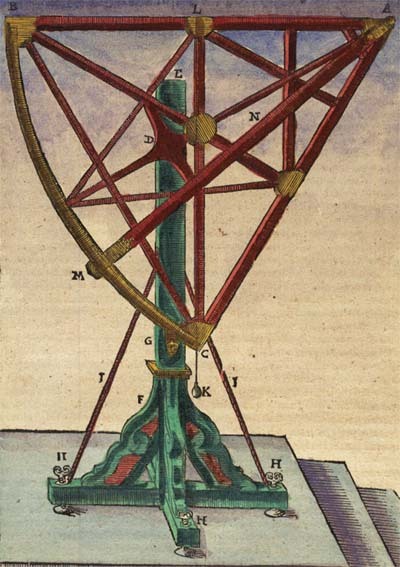 Figure 1b: Armillary sphere of Tycho Brahe. (Source). 2. A mural quadrant (Libna) for the observations of the declinations of the sun and the stars. It is said that Taqî al-Dîn preferred the above mentioned quadrant instead of the suds-i Fakhrî  and two rings used by the previous astronomers. It is two brass quadrants with a radius of six meters placed on a wall and erected on the meridian (see Figures 2 a-b). Figure 2a: Mural quadrant (libna) of Taqî al-Dîn. Source: Istanbul Topkapi Library, Hazine 452, f. 9a. 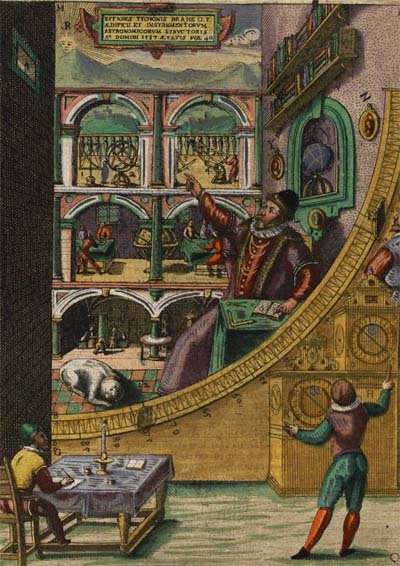 Figure 2b: Mural quadrant of Tycho Brahe. (Source). 3. An azimuthal semicircle (dhât al-samt wa-‘l-irtifâ’) for the measurement of the altitudes and the azimuths of the stars. This instrument composed of a copper ring representing the horizon and a semi circle perpendicular to the horizon (see Figures 3 a-b). Figure 3a: Azimuthal semicircle (dhât al-samt wa-‘l-irtifâ’) of Taqî al-Dîn. Source: Istanbul Topkapi Library, Hazine 452, f. 10a. Figure 3b: Azimuthal semicircle of Tycho Brahe. (Source). 4. Parallactic ruler or triquetrum. Generally the parallax of the moon is observed with this instrument. It is made of three long pieces of wood. The first is perpendicular to the horizon; the second is connected at the head of the first with an axis. The third which has the chord division is nailed near the base (see Figures 4 a-b). Figure 4a: Parallactic instrument of Taqî al-Dîn. Source: Istanbul Topkapi Library, Hazine 452, f. 11ba. 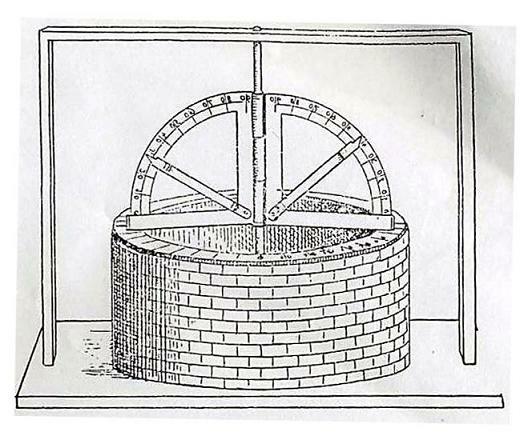 Figure 4b: Parallactic instrument of Tycho Brahe. (Source). 5. The wooden quadrant (Rub‘). It is a quarter of a circle made of wooden rulers. The altitudes of -the stars and even their distances to zenith are measured by this instrument (see Figures 5 a-b). Figure 5a: Wooden quadrant of Taqî al-Dîn. Figure 5b: Wooden quadrant of Tycho Brahe. (Source). 6. 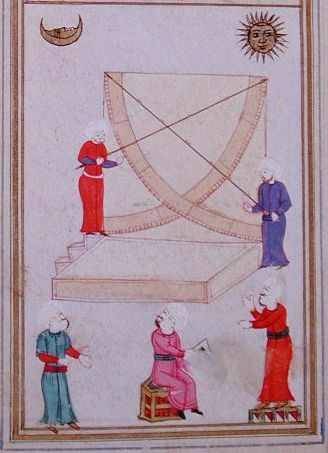 Dioptra (dhât al-thuqbatayn), generally called the instrument with two holes for the measurement of the apparent diameters of the heavenly bodies and eclipses (see Figure 6). Figure 6: Diopra (dhât al-thuqbatayn). 7. The instrument with cords (dhât al-awtâr) for the determination of equinoxes. This instrument is composed of a rectangular base, the side of which is equal to the radius and the sine of the latitude and two columns equal to the latitude and erected on the base. A string is stretched. With this, the equinoxes of fall and spring are designated (see Figure 7). Figure 7: Instrument with cords (dhât al-awtâr). 8. 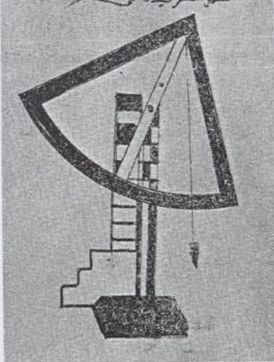 Sextant (mushabbaha bi’l manâtiq) used to measure the distances between the stars (Figures 8 a-b). Figure 8a: Sextant (mushabbaha bi’l-manâtiq) of Taqî al-Dîn. Source: Istanbul Topkapi Library, Hazine 452, f. 14b. Figure 8b: Sextant of Tycho Brahe. (Source). 9. Observational clocks (see Figure 9). Let us put, for the present, here a point and turn our eyes to Europe. Tycho Brahe built an observatory under the sponsorship of king Frederic II of Denmark in 1576 he equipped this observatory with the best possible instruments of his time, succeeded to become one of the great astronomers of all history by building these refined instruments and making accurate observations and helping the discoveries of Kepler. The recent researches showed that there is an exact identity between most of the instruments of Tycho Brahe’s and Taqî al-Dîn’s observatories. I am going to compare the instruments of these observatories in three groups. The first group includes the instruments known and built by earlier astronomers since Ptolemy. They are armillary sphere, triquetrum or parallatic instrument and dioptra. In both observatories they were built as large as possible in order to show the minutes (see Figures 1 a-b). 1. The mural quadrant (libna) is fixed upon a wall erected in the meridian built in both observatories. 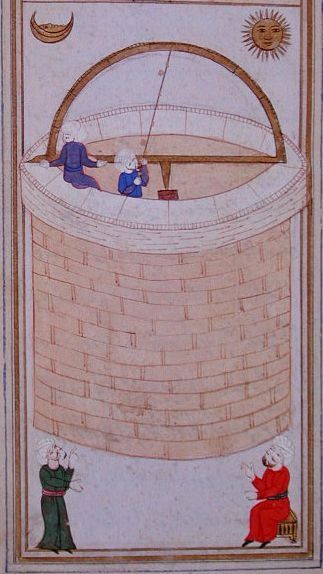 The radius of Tycho’s instrument was about 2 meters whereas Taqî al-Dîn’s six meters. Tycho’s quadrant was divided by means of transversal points so that five seconds of arc could be read on it . We have no record showing whether Taqî al-Dîn knew the transversal divisions or not. Only we must make a remark that Abd al-Mun’im al ‘Âmilî (16th century), contemporary of Taqî al-Dîn, gives a picture on which the transversal divisions are obvious, in his Kitâb al-ta’lîm âlât-i zîj (see Figures 10 a-b) . Figure 10a: Transversal divisions of Al-‘Âmilî. Figure 10b: Transversal divisions of Tycho Brahe. 2. Azimuthal quadrant or azimuthal semicircle, predecessor of theodoilt used to determine altitudes and azimuths are founded in both observatories. In the Islamic world this instrument which was reached its perfection in Nâsir al-Dîn al Tûsî, was used since Ibn Sinâ (d. 1037) (see Figures 3, 11, 12) . Figure 11: Azimuthal quadrant of Nâsir al-Din Tûsî. Figure 12: Azimuthal Instrument of Ibn Sînâ. Small and portable quadrants, made of wood were in use in medieval times, but large and fixed ones are used later. 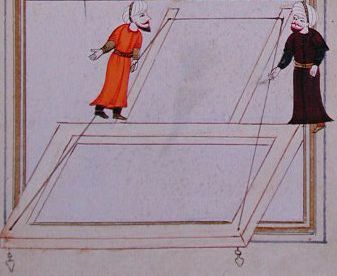 Taqî al-Dîn and Tycho Brahe built wooden quadrants. The radius of Taqî al-Dîn’s was 4.5 meters, whereas Tycho’s was 5.5 meters (see Figures 5 a-b). The third group of instruments includes contemporary discoveries. 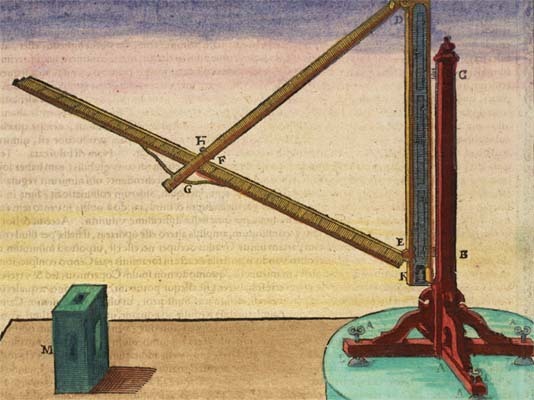 Tycho Brahe and Taqî al-Dîn were not satisfied with the instruments of the previous astronomers. They made new discoveries. These are the sextant, the wooden quadrant and the astronomical clock. 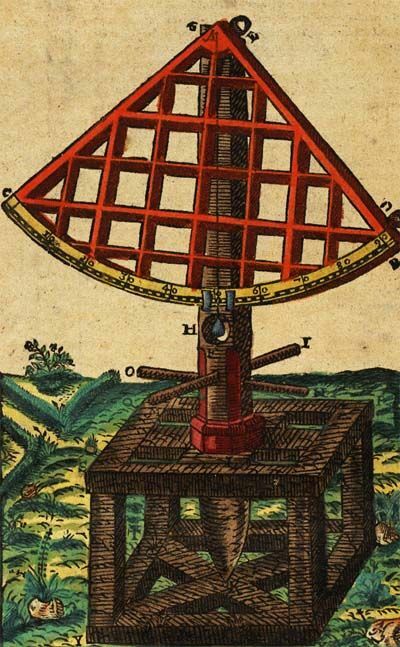 Taqî al-Dîn’s mushabbaha bi’l manâtiq and Tycho Brahe’s sextant should be considered among the great achievements of the 16th century. 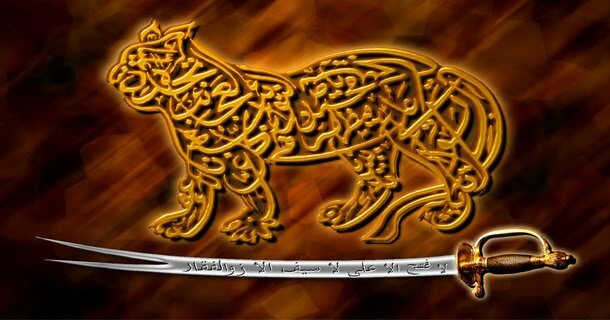 Mushabbaha bi’l manâtiq is composed of three rulers. Two of them are attached as the rulers of the triquetrum. 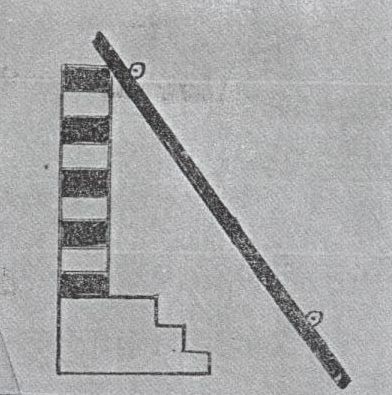 An arc is attached at the end of one of the rulers. This instrument is used to determine the distances between the stars . 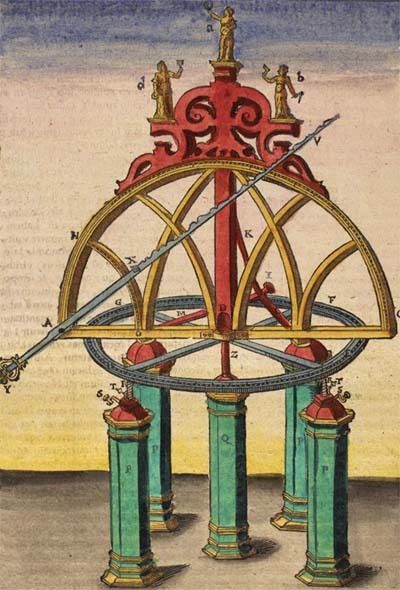 In Astronomiae instauratas Mechanica, Tycho Brahe says: “I now come to the explanation of the astronomical sextant, since this is particularly suited for the determination of distances in the sky between the stars. For, having found the experience of many years that the astronomical radius by no means sufficed for the solution of the problem with reasonable certainty and accuracy, I devised, driven by necessity, some sextants of different forms which solved this problem accurately and without uncertainty”  (see Figures 8 a-b). Despite the resemblance and the parallelism between these two observatories, we can say that, in respect of the quantity of the instruments of Tycho Brahe’s observatory, it was clearly superior to Taqî al-Dîn’s. We can say that with Tycho Brahe Europe not only reached but also surpassed Islam in the field of constructing observational instruments. Sevim Tekeli, “Mechul Bir Yazarin Istanbul Rasathanesinin Aletlerinin Tasvirini Veren “Alât-i Rasadiye Li Zic-i Sehinsahiye” Adli Makalesi”, Arastirma, vol. I, p. 91. Nawîzâda ibn Yahyâ Âtâî, Dhayl al-Shaqâ’iq , vol. I, 1268 H, p. 268. S. Tekeli, “Mechul Bir yazarin”, Arastirma, vol. I, op. cit., pp. 71-122. Sevim Tekeli, “Takiyuddin’in Sidret ul-Munteha’sinda Aletler Bahsi”, Belleten, vol. 25. p. 213-38. Aydin Sayili, “Alâ al-din al Mansur’s Poems on the Istanbul Observatory”, Belleten, vol. 20, 1956. Images of all the instruments of Istanbul observatory ca be found in the article published by Sevim in the proceedings of The International Symposium on the Observatories in Islam (Istanbul, 1980), on pp. 39-44 (the Chief Editor). 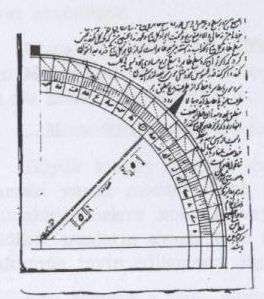 Abû Mahmûd Hâmîd ibn al Khidr al Khujandi (10th century) constructed an instrument, made of an arc of a sixty-degree of the meridian, and called it al-Suds al-Fakhri, for the measurement of the obliquity of the ecliptic. It has a radius of about twenty meters, and surpassed all previous ones in size. This arc is placed on a wall, erected on the meridian. Sevim Tekeli, “Nasiruddin, Takiyuddin ve Tycho Brahe’nin Rasat Aletlerinin mukayesesi”, Ankara Universitesi, Dil ve Tarih-Cografya Fakultesi Dergisi, vol. 16, No. 34, p. 319. Tycho Brahe, Description of His Instruments and Scientific Work: Astronomiae Instauratae Mechanical, edited and translated by H. Raeder, E. Stromgen, and E. Stromgen, Copenhagen: Munksgaard,1946, pp. 28-31. British Museum, Pers. Add. 7702, p. 4b. Sevim Tekeli, Nasiruddin, Takiyuddin ve Tycho Brahe’nin Rasat Aletlerinin, op. cit., pp. 328-329. Sevim Tekeli, 16’inci Asirda Osmanlilarda Saat ve Takiyuddin’in “Mekanik Saat Konstruksuyonuna Dair En Parlak Yildizlar” adli Eseri. (The Clocks in Ottoman Empire in 16th Century and Taqî al-Dîn’s” The Brightest Stars for the Construction of the Mechanical Clocks”. Ankara 1966, pp. 8-9. Tycho Brahe, Description of His Instruments and Scientific Work: Astronomiae Instauratae Mechanical, op. cit., pp. 29-30. Sevim Tekeli, “Takiyuddin’in Sidret ul Muntehasinda”, op. cit, p. 224. Tycho Brahe, Description, op. cit., p. 73. Sevim Tekeli, Mechul bir Yazarin, op. cit., p. 97. Sevim Tekeli, “Takiyuddin’in Sidret ul Muntehasinda, op. cit., p. 226. * Emeritus Professor, Ankara University, Ankara, Turkey. 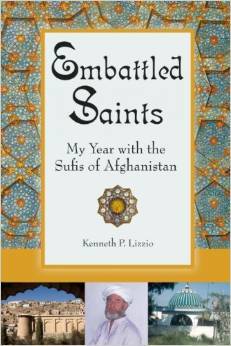 See: Professor Sevim Tekeli: A Short Autobiography. This article was first published in the proceedings of “The International Symposium on the Observatories in Islam (19-23 September 1977).” Edited by Muammer Dizer. Istanbul: Milli Egitim Basimevi, 1980, pp. 33-43. We thank Professor Sevim Tekeli and Professor Muammer Dizer for permitting us to reproduce it for the benefit of our readers.